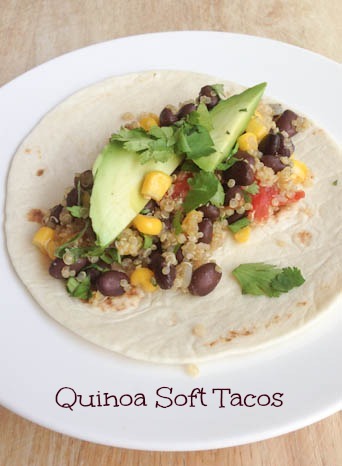 Move on over beef and chicken…there’s a new protein in Soft Taco Town…Quinoa! Everyone at our dinner table is a fan of quinoa…one more reluctantly than the others. Tyler wasn’t quite convinced about this new ingredient in his tortilla, but I was able to convince him that it was like “tiny rice” and he took a bite, then another, and so on. Then he made me giggle by complaining about the “green thing on my green avocado”…he didn’t want to eat the cilantro piece that was stuck on his avocado slices. Silly little dude. You can tell by the looks of the photo, that this recipe is pretty straightforward. Mix in the beans, corn, tomatoes. Top with avocado slices and cilantro. Let me know what you think about the new protein in Taco Town! Cook the quinoa with water (or chicken broth if you want more flavor), as directed on the package. Add the taco seasoning while it’s cooking. Once cooked, stir in the black beans, corn, tomatoes and combine together. Spoon the quinoa mixture into the tortillas and top with avocado slices and chopped cilantro. I just started eating quinoa and LOVE the flavor. This looks great! Thanks! Love and am going to try this recipe on my family, although they have never been known to only eat 2 tacos each! Made these for dinner last night and my family LOVED them! Eating leftovers for lunch as I type this, will be keeping this recipe to use again, thanks!